When I started this blog, the majority of it was observations about people I saw on the train, or while waiting for trains. I haven’t really done a post about my observations lately, but for the most part the majority of things I see are remembered as short tidbits, and nothing worth writing an entire post about. If I actually kept a diary, tidbits like these would likely be found inside… just quick thoughts about the things and people that surround me on a day-to-day basis. As I don’t really have anything to post today, I figured I’d leave you with a collection of some of my recent thoughts while riding the train. But rest assured, I am currently working on a pretty big project for the site, and when I (hopefully) debut it next week, I think you’ll all be pretty pleased. People leave things on the train all the time. I was just thinking the other day, if someone was about to forget their phone, or bag, or wallet, I’d ask them if it were theirs, so they don’t get off the train without it. But then I realized what a terrible person I am – if you were about to forget a bag from Junior’s the only thing I’d say is, “that’s mine!” I don’t want your wallet, or your laptop. Just give me your cheesecake. Sometimes the guy in the ticket booth at White Plains gets rather excited when he announces trains. Once I heard, “Now on trrrrack one is the train going to… nowhere. Never mind. This train only goes to North White Plains,” and, “Nooooooooowww on trrrrrack one is the 5:59 local trrrrrain to Southeast, making all local stops. Yes, this train will be making all the stops you know and love. Trrrrrrrack one.” I haven’t heard him lately, though. I wonder where he is. When my train passes Mount Kisco in the evening, there is usually this dark-haired woman named Christine on the platform. I know nothing other than her name, and that she likes to laugh. Sometimes when the doors open I poke my head out and say, “Hello Christine.” I gave her my little card that has this website’s address on it once. Maybe she’s reading this right now. Hello, Christine! I have an overactive imagination. I also have a bad habit when I observe people, determining who they seem to resemble physically, and calling them that in my mind thence forward. Regular riders of my morning train are an older Sarah Palin, and an Amy Winehouse – minus the drugs. I like to read books on the train, and I try to read a book per week. After calculating it out, I really only spend about six hours per week on the train – three of which are reading, and three of which are bullshitting with other people. It isn’t a lot of time when I compare it to hours using the computer. I probably am using the computer for ten hours, if not more, each week day. This is probably why I gained twenty pounds after graduating college. Walking to the train station the other day, this strange animal ran out in front of me. It took me a few moments to realize it was a cat, and not an ordinary cat, a three-legged cat. 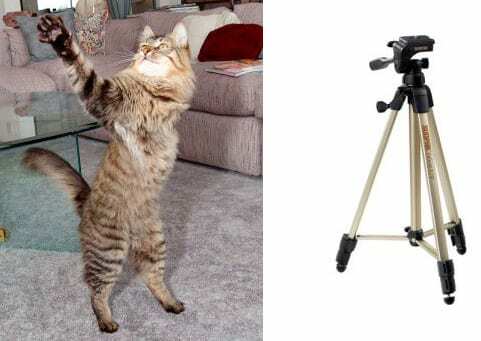 If I had a three-legged cat, I’d name him Tripod. Sometimes the bus driver really freaks me out. One of these days he’s really going to flip the bus over. A few days ago he accidentally hit the curb so hard I was slammed into the window… and I have a several inch long bruise on my arm to prove it. I follow @OWNEYtheDOG on twitter. For those who don’t know, Owney was a real dog that used to ride on mail trains back in the day. Owney was apparently murdered – shot dead, and was later brought to the taxidermist. He’s on display at the Post Office Museum in Washington DC. The thing that freaks me out is that whoever does the twitter posts as if they were that stuffed dog. This disturbs me. Even taxidermied dogs are on twitter! Next thing you know, my mother will be on there. I’m used to people telling me that they like my hat. It does freak me out when they sneak up behind me and attempt to whisper it in my ear. Most especially if they reek of alcohol. However, the thing I really don’t get is why people during the summer ask me where my hat is. I may like hats, but I’m not an idiot. My grandmother is wonderful. I think it takes only a little sip of alcohol to make her tipsy. She tells lots of good stories then… stories about the original Penn Station, of taking the train all over the country in the ’40s, being afraid her train was going to fall off the Horseshoe Curve… How she’d take the kids on the train and buy the cheaper child ticket, even though some of the kids were too old. Of course my one uncle would admit such to the conductor… the other just had such a bad temper, my grandmother told me she’d buy him rubber dog toys to take for the ride, he’d break all the regular toys. When I get a text message, my phone makes the sound the M7 trains make. It baffles people at work meetings. It really baffles them when I’m riding my usual train – an M3. But then someone decides they’ll text me five times in quick succession. Then I just look like an idiot. 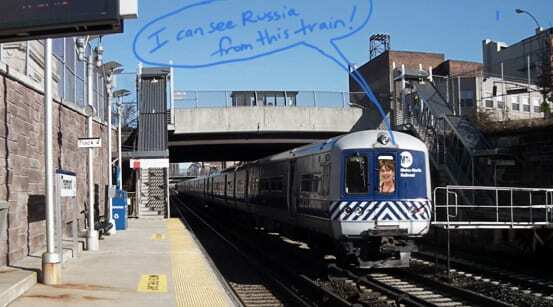 Everyone always wants to blame Metro-North, but sometimes it is the passengers’ fault that the train is late… like the time there was a man standing in the doorway that refused to move. Despite the conductor yelling at him, he still stalled the train. I heard some news about banning smoking on the platform. I like this idea. I’d rather not be subjected to your disgusting and headache-inducing habit. Inevitably someone complains about the thought and says, “Remember when they even had smoking cars?” You know what I remember? The tar-black ceiling of Grand Central when I was a kid… all from cigarette smoke. Ah, yes. Nostalgia. If I had to pick the station with the most obnoxious people, I’d likely pick White Plains. They are like animals there. They’ll push anybody over to board that train, even a little old lady with a cane. Because it is such a populated station, there are always going to be people running for the train and not quite making it. If the conductor kept the doors open for all of them, the train would never leave. When this happens the person usually shouts profanities at the conductor, and probably writes an angry note to Metro-North (I don’t think I could be a conductor, I don’t have thick enough skin). The most amusing part is that White Plains has the most trains of any station on the Harlem Line. In rush hour, there is another train in just five minutes. Is it really worth all that anger? It is amusing to me how many people still attempt the old trick of hiding in the bathroom to evade paying the fare. Conductors should have mops available on all trains to give to these people. If they aren’t going to pay, and they are going to be in the bathroom, they might as well clean the damn thing while they are there. Whenever I used to ride Metro-North with my family, my dad would buy a child ticket for me hoping the conductor didn’t notice. He did, every single time. 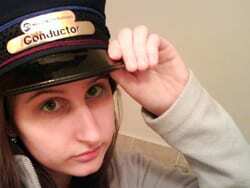 The most recent time I was 15, and the only reason the conductor didn’t throw me off the train (or so he told me) was because it was Christmas Eve. Thanks Dad. On the announcer at White Plains, it reminded me of riding the train as a kid when the conductors used to walk from car to car announcing the stations, with a heavy booming voice, “Neeeeext stop, Valhalla. Vaaaaalhalla next.” I don’t know whether the cars didn’t have PA systems or whether they just didn’t work, but it sure did ensure conductors knew how to project their voices. On the crazy old man across from the conductor, those are really cool seats. I found in the back of the train on one trip home that the cab door had been closed so it was only a half cab, leaving those seats accessible. Cool spot to sit and see where you’ve been. Also on the crazy old man, it can be kind of intimidating crossing between cars like that when the train is moving. I had that happen to me one time on the LIRR when traveling with a 7-year-old. Boarded the last car of a 10-car train to find out that due to track work only the first door of the first car would open at our destination. That’s a long walk with a lot of heavy doors on a moving train, especially when holding someone’s hand between every car. Tripod – It’s a dog not a cat, but see the movie “Trapped in Paradise”. So…the ticket seller with crazy announcements in white plains? He’s me! I would recognize those anywhere…I also like to work the words plethora and schmorgasboard into my announcements. As for where I am now? I do the same job in Greenwich, stamford, and fordham. It’s nice to be noticed though! Haha awesome! I love your announcements. Makes things interesting. Thanks..you should come to stamford, that’s where the real fun happens. The only person who seemed to ever notice me in white plains was the newsstand guy. He suggested I announce a train as making every stop along the merry highway of life, so I did. But most people there seemed to stare blankly at me, or think I’m nuts…which I probably am anyway..
All the good people worth knowing are a little bit crazy. I do need to come to Stamford at some point for my tour of the New Haven Line. I’m slightly afraid of getting yelled at by police there, though. An Irish coleen, Carmel O’Donell , was boarding in our house in Port Chester, and she was employed in Manhattan , traveling to and from work by train. After she arived home on this Friday afernoon , she had to travel to the airport because she was retuning to Ireland for a vacation with her family, but soon there was a terrible problem because Carmel left her purse on the train, which contained all her money and the airline tickets for her flight that evening. Carmel was devastated. We called the Station Master at GCT and he identified the train based on the time of departure . The train ( TG!!!) finished the run in the Stamford yard , and we called there with the number provided by the Station Master. Yes , they had Carmel’s purse which , we presume, was found by a conductor; and hours later , Carmel was happily somewere over the Atlantic Ocean.